You’re exploring in the rain forest, and you’re trying to capture the best animals to take back home…on film. Going through the rain forest, though, is hard work, and you can’t do it alone. But when you take others with you, they might get better snapshots. You’re not usually a fan of mosquitoes (especially not this rain forest variety), but maybe they will help put the competition off… Can you collect the best portfolio of photographs to bring home? 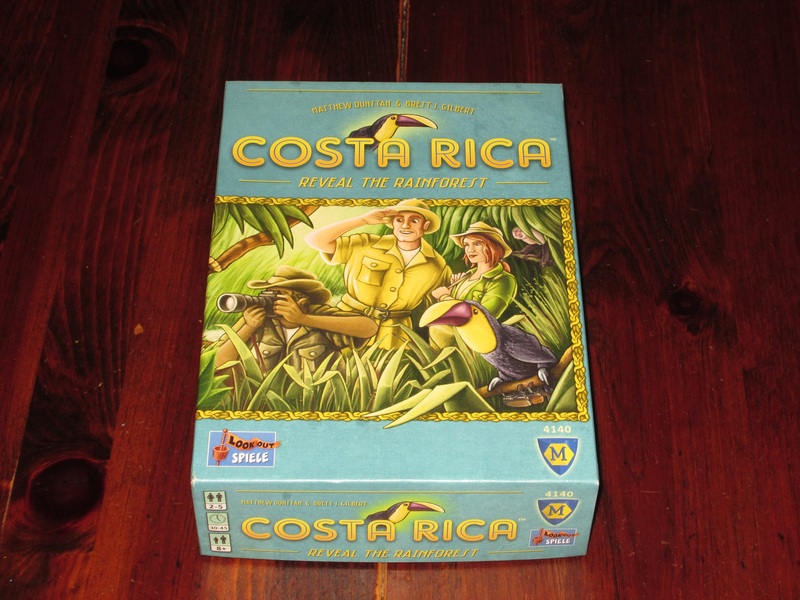 Costa Rica is a push-your-luck exploration set collection game. 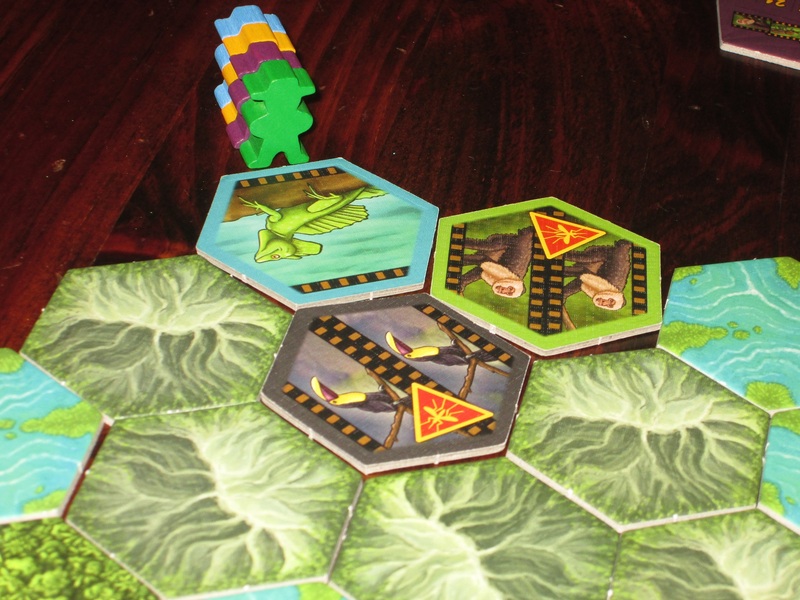 Players have explorers in six expeditions and are trying to collect the best photos of rain forest animals. The player with the most points at the end of the game wins. Costa Rica set up for four players. 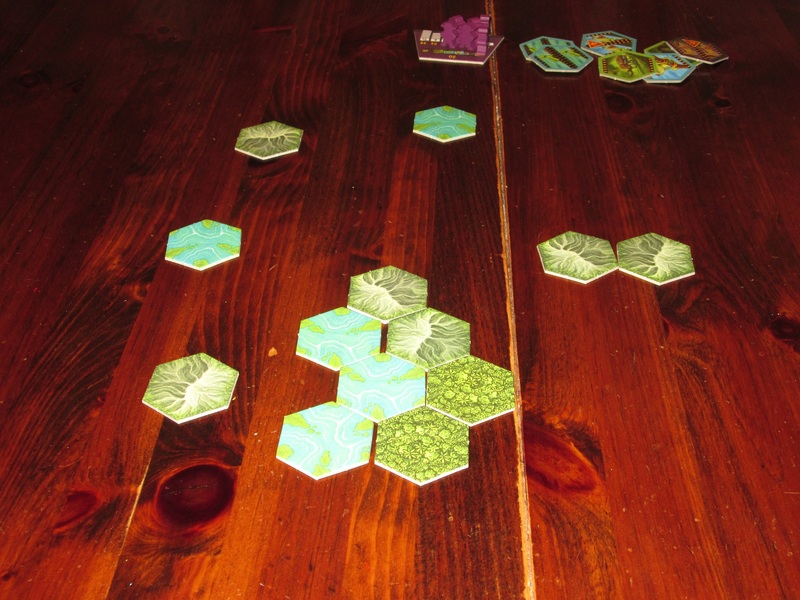 To begin, players mix the exploration tiles face down and lay them out in a hexagon formation. Players receive a player aid and place one explorer at each point of the hexagon. The player who was last in a rain forest is the first expedition leader. 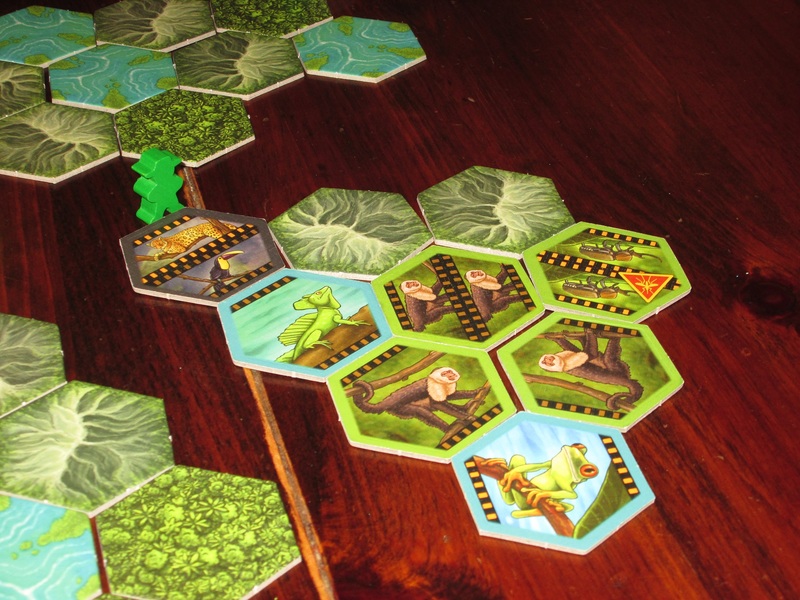 On a turn, the expedition leader chooses one of the expeditions on the board where he or she has an explorer and begins revealing adjacent tiles in the rain forest. 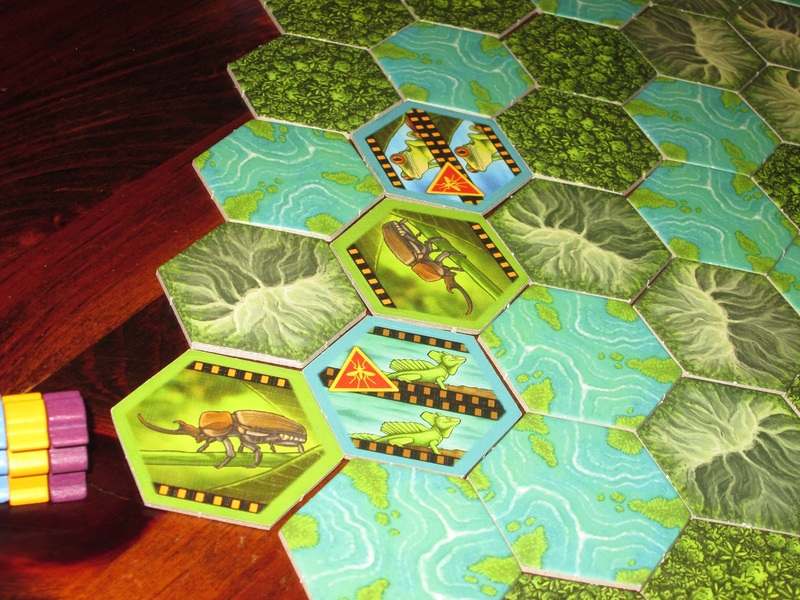 After each tile, beginning with the explorer and moving clockwise around the table among players who still have an explorer in the expedition, each player either passes or claims all the tiles that have been revealed. If everyone passes, the expedition leader reveals another tile. Once one person has claimed tiles, the expedition is moved to the space of the last tile revealed, and the player who claimed the tiles removes their explorer from the expedition. It is the next player’s turn to lead an expedition. The six animal types in Costa Rica. Tiles have one of three terrains–mountain, river, and forest–and each terrain has two different animals, one rare and one common. Tiles can have one or two animals on the tile, and the commonality of one or two pictures depends on the terrain. Some tiles have threat markers on them. The first threat marker means nothing for the expedition, but if the expedition leader reveals a second threat marker, the two tiles with threats are discarded, the expedition leader claims the remaining tiles, and the expedition leader is removed from the expedition. 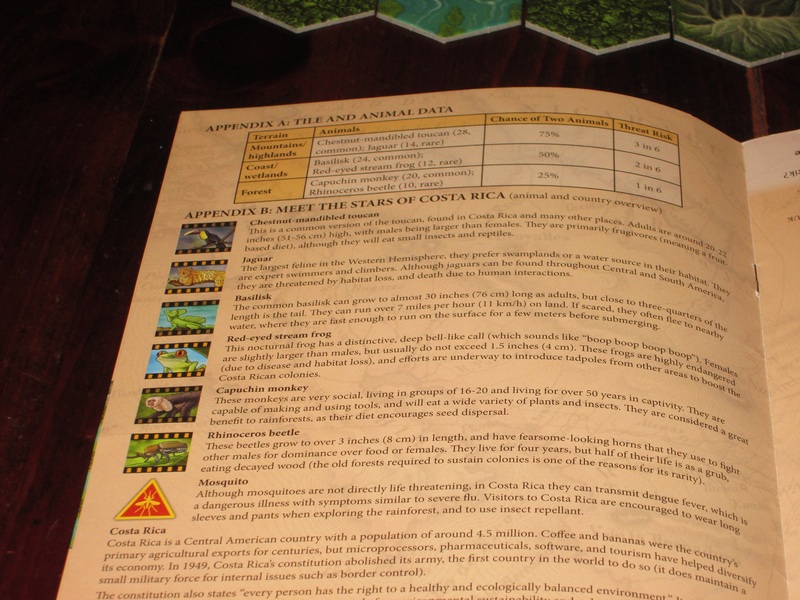 The bulk of the rules for Costa Rica fit on a single spread in the rulebook. 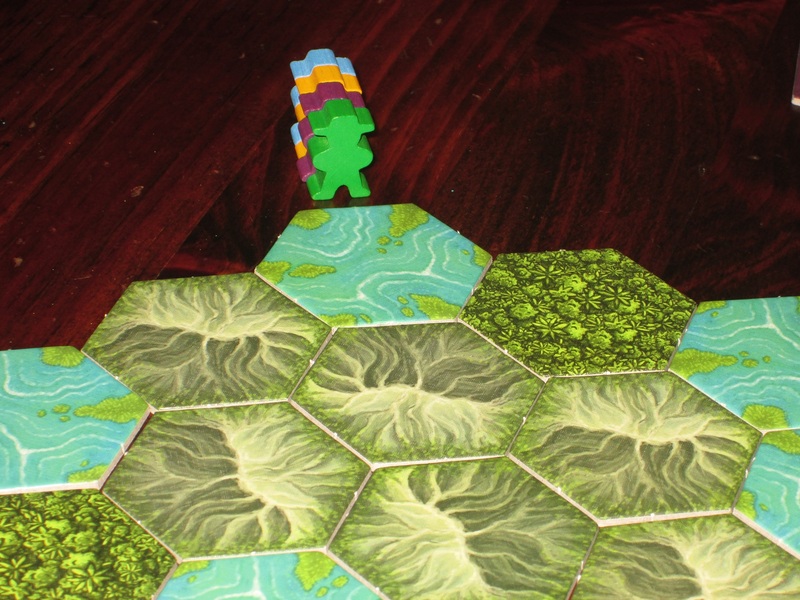 If ever an expedition is stranded (no adjacent rain forest tiles), that expedition is removed from the board. The game ends once either all explorers have been removed from the board or all tiles have been removed from the board. 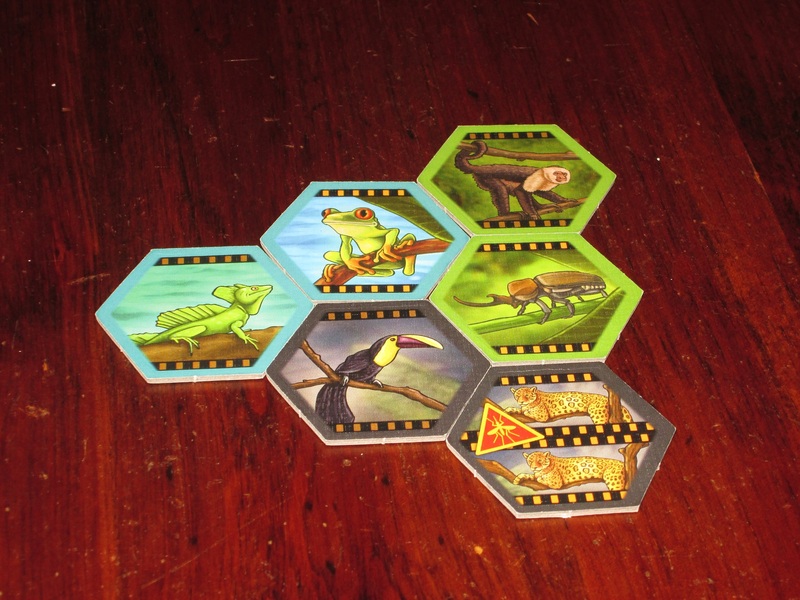 Players score points for each set of six different animal tiles they have and for each set of the same animal tiles they have. Whoever has the most points wins. This animal supplement gives more information about each of the animals found in the game. It’s a nice touch. Nothing’s Worryin’ Me, or Nothing Seems to Fit? I’m a huge fan of games with a press-your-luck mechanism. I’m not a gambling man in real life, but boy, do I love it in my games. Should I play conservatively for small gains, or should I make the big bet, potentially losing it all? Press-your-luck games bring something out of me and out of my friends that I might not see in other contexts. But after Can’t Stop–arguably the greatest and purest press-your-luck game–where do you go? I love seeing innovation in the genre, whether it’s the semi-cooperative backstabbery of Celestia or the slot-machine auctions of Ra. Or the spatial exploration set-collection of Costa Rica. Costa Rica is so smooth to play, you can almost forget its innovation. What makes Costa Rica a fresh take on press-your-luck is its spatial movement. You aren’t rolling dice (as in Can’t Stop) or flipping cards from a deck (as in Incan Gold), where each individual roll or card flip is more or less discrete from each other roll or card flip. Instead, in Costa Rica, each decision to keep going is a decision both to try your fate and to move your expedition somewhere else. And movement is a big deal in the game. There are three kinds of terrain, and you can find two different animal types in each of them. There’s also a certain probability of getting two animal pictures versus one, and also the probability that you’ll find a threat symbol. So where you go determines what animals are available to you, what you might find, and the likelihood of your expedition being cut short. And where you go also determines the possibilities that are open to you if you keep going after the next tile flip, or to the rest of the party once someone claims the tiles. These two expeditions are at a crossroads, and blue is next. It’s possible for the single blue to strand the other expedition. Things can turn nasty quick! And movement is also what provides the bite to this otherwise friendly traipse through the rain forest, because if an expedition is ever left without any tiles adjacent to it, the explorers in that expedition automatically go home empty handed. So the expedition leader can, if the tiles and other players allow it, lead the expedition into a remote backwoods, leave with the pictures, and potentially strand the rest of the explorers without hope of collecting tiles. And this is where the game gets interesting. At the start of your first game, your thought process will usually run along typical press-your-luck-game lines. You’re thinking in strict terms of threat symbols and calculating the likelihood that the next tile will be a threat. But somewhere in that first game, usually it dawns on players that there’s more to the game. You’re not thinking simply in terms of what will score you the most points, but also in terms of how to keep those points from the other players. Since the expedition leader always has first crack at the tiles turned over, if the other players don’t claim them early, they’re leaving a large haul for the leader–so it might be better to get less sooner just to prevent someone else from getting a huge collection of points. Because the game is spatial, it’s not just a matter of “Do I need those tiles?” It’s also a matter of “Will I have opportunity to get a better collection of tiles, or am I likely to be stranded?” Taking some tiles is always better than taking none with an explorer, so players have to weigh what’s happening in this particular expedition with what is likely to happen in further expeditions around the board. Green is all by himself. This could be dangerous for the other players. This is wonderful, because it creates all sorts of interesting dynamic player interaction around the table. As players bail from expeditions with their spoils, they are no longer invested in the welfare of the expedition they were just part of. It can be a huge boon to determine when to stop and when to keep going alone: you’re never at risk of someone claiming your spoils before they’ve ripened. But this is also a huge liability: if you are alone in an expedition, it behooves every other player in the game to prevent you from reaching your Christmas-morning haul. The way expeditions move carves the board in interesting ways, and it ensures that every play of the game is tense and exciting. See? I told you it was a bad idea to leave green alone. That’s quite a haul! If you haven’t guessed it, Costa Rica can turn nasty. You can make moves that specifically hamper some players and not others, and the game provides plenty of opportunity (you might even say incentive) to do so. But the game also provides guard rails to keep it from going too far. 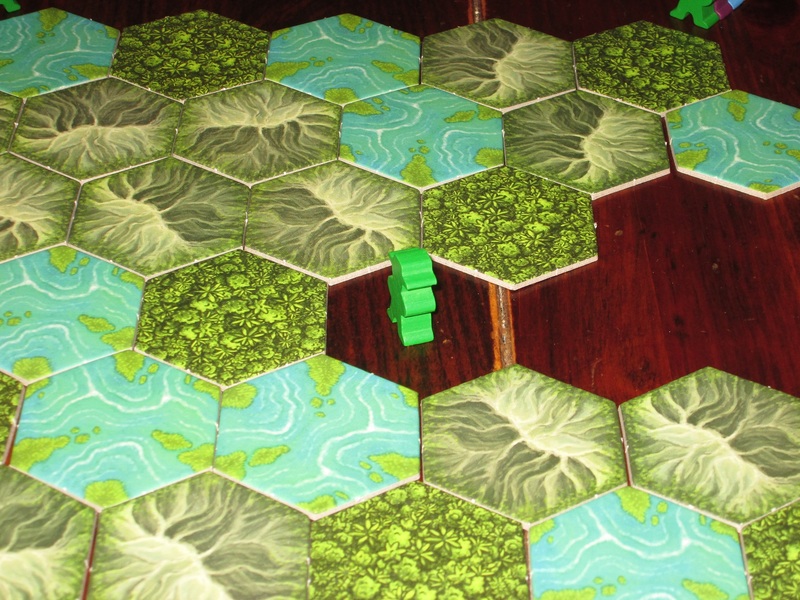 For one thing, it’s a press-your-luck game, and despite your grand plans to strand other players’ expeditions on the board, you are limited by the tiles you reveal. If you reveal threat tiles early, it doesn’t matter what you planned; your turn ends. And at the start of the game, each player is equally invested in all the expeditions, so there aren’t great opportunities for nastiness until the game takes shape somewhat. I like, too, that while you can try to stick to safe terrain, the game rewards players for taking risks. The most fruitful finds are in the mountains, which is also where threats are ever present. It can be quite lucrative to collect sets of six different animals, but you have to traverse all the terrain types to get them. Ugh. Another expedition cut short. Whose idea was it to come to the rain forest again? The player aids in Costa Rica are top notch. They are clear and help players outsource some of their calculations as they play. The components in Costa Rica are nice and work well. I love Klemens Franz’s artwork in general, and the art here is no exception (although there aren’t many different illustrations). 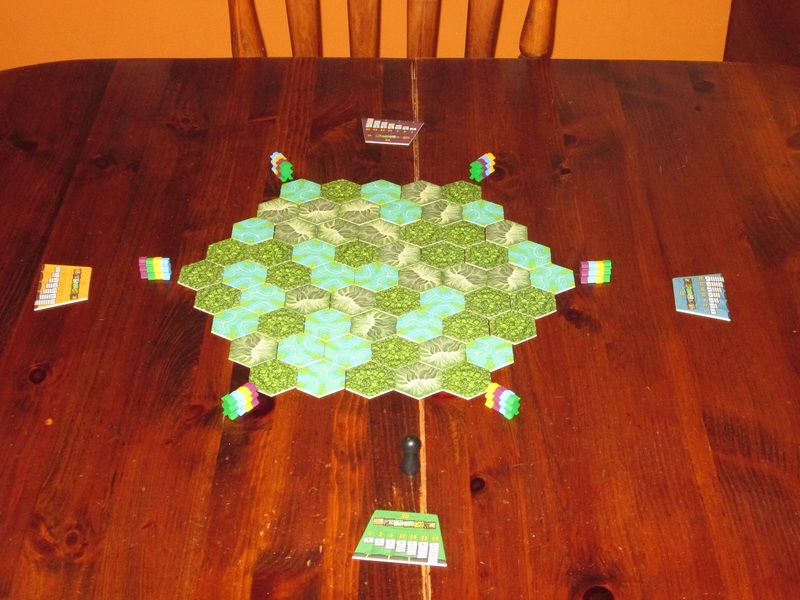 The hexagon tile board is appealing to look at, and the wooden player pieces are great. The player aids are some of the most useful I’ve seen. They display graphically and intuitively the probabilities for finding two pictures or one and for finding a threat symbol on each kind of terrain. Because these aids are so clear, players can outsource a lot of their calculations to the aids and stay focused on the weight of their decisions and on routing their opponents’ plans. There are subtle design cues that draw the experience together. (Lest you think that you are capturing or hunting wild beasts in the rain forest, the animal pictures are surrounded by film sprues, and within these sprues are gold or brown squares that tell you if the animal is rare or common, respectively.) 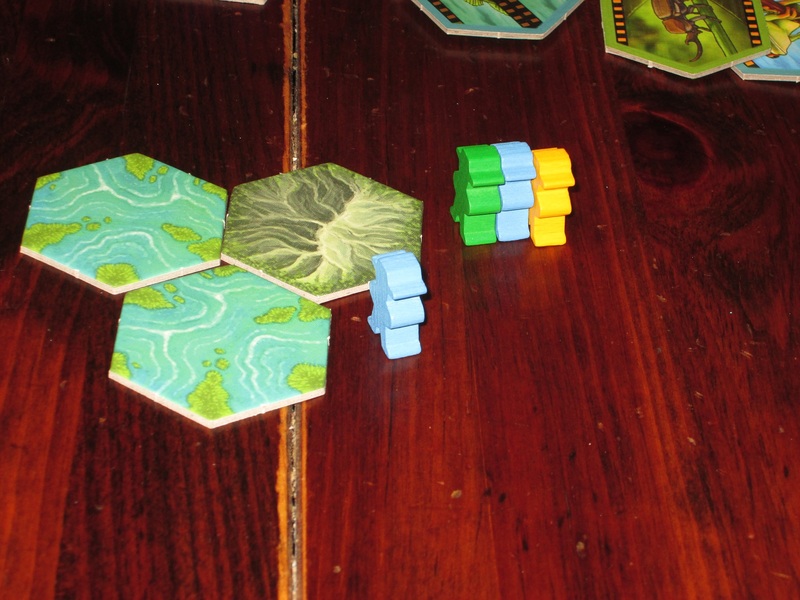 The hexagon board does move around some when you’re exploring (it doesn’t have the boundary pieces like newer editions of Catan do), but that’s not a big issue. The box is bigger than it needs to be to contain the game, and there’s no insert, but it’s still the small Euro size box (think Carcassonne). 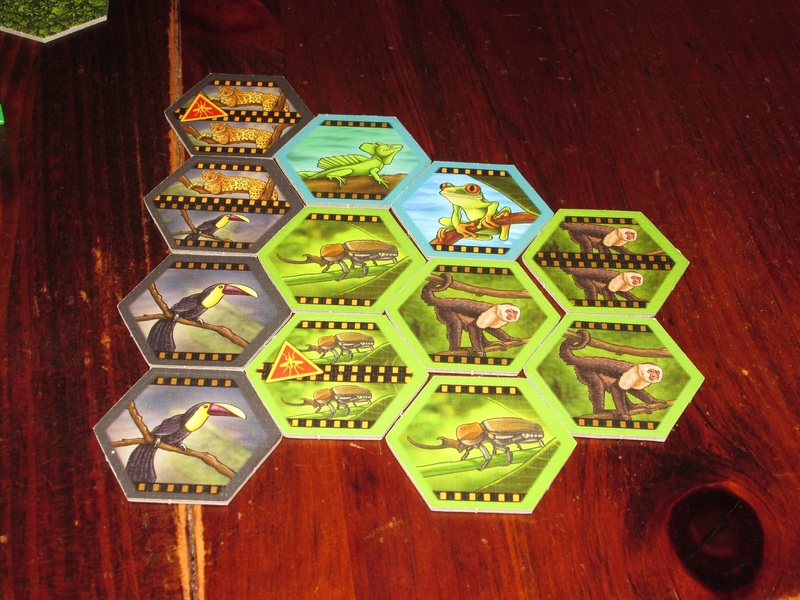 The rules are clear, and they even include information about each of the species in the game. The components aren’t likely to wow you, but they also aren’t likely to disappoint you. The end of the game. These are the tiles that will remain unexplored. Green’s winning haul at the end of the game. I expected to like Costa Rica based on the description, but I’m surprised how much I ended up liking it. What seems at first like a simple press-your-luck game opens up as you play it to reveal lots of interesting wrinkles that deepen the experience. In this respect, it seems to fit the Spiel des Jahres mold. It’s a little early to make predictions for 2017, but I wouldn’t be surprised to see this game recognized in some capacity. It’s a pretty game to look at, and it’s short enough that you can usually play another game after you’ve finished the first–which you will probably want to do. 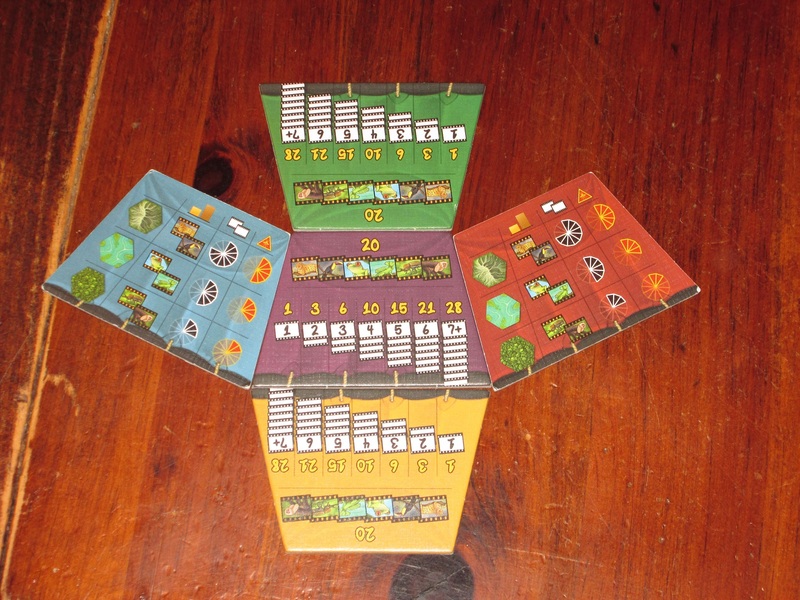 If you like your press-your-luck games with a decent dose of strategic decision making, then Costa Rica should be your next game night destination. 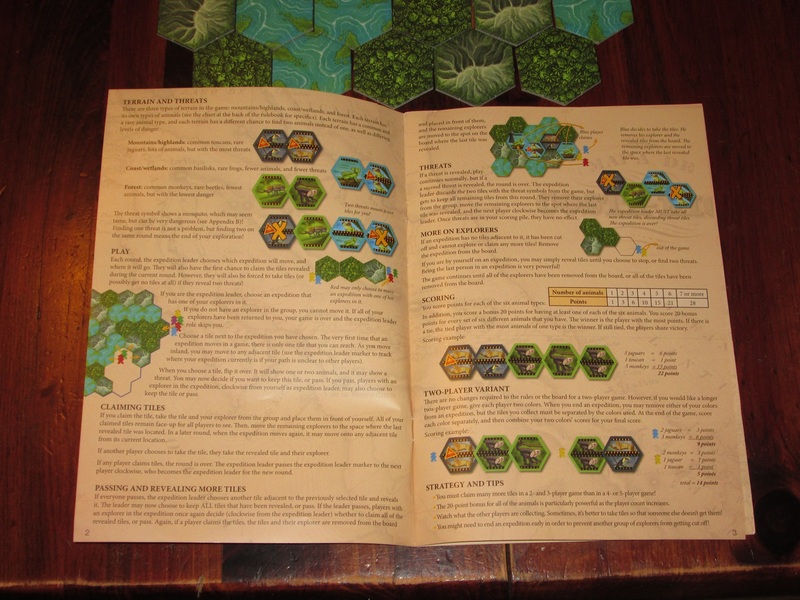 iSlaytheDragon would like to thank Mayfair Games for providing us with a copy of Costa Rica for review. It's fast and easy to teach. Do you still play this game years later? My group stopped requesting it, so I traded it on (since space is at a premium). However, I do regret that choice sometimes.